In my head, I keep a mental list of my top 5 thrift store finds. But over time, I've had to separate into three lists: things for me, things for the girls, and all other. Because I am a financially shallow person, my finds are often very high quality or expensive items and their presence on the list is related to what percentage of the retail price I paid rather than how much I like the item. Honestly, by now, I've forgotten a lot of the mental list, but I still know a good find when I see it. For Halloween, I had a difficult time with the girls costumes. Beezus wound up being a rooster (rooster top and red tights were $7 at thrift store) and I fashioned a costume for Ramona out of three thrift store pieces: a pale yellow kids sweatshirt, a golden yellow poor quality men's fleece, and a shiny orange high tech woman's running shirt (I used that orange running shirt to make pants and a skirt for her costume). I really wanted a costume for myself, and a good one. I would up finding an orange and black witch dress that fit me well (Mr. Q said I looked good !) and will last for years to come. It is cheaply made and although it doesn't have the usual criteria to fit my "top finds" the appropriateness for the season and fit bumps it on to the list. There were the usual parties at school, and then my sister came over on Halloween evening. The girls started off strong with their "Ana" and after 5-6 houses, Ramona said that she was going to stay home and help hand out candy but that Esther could ask people for an extra piece for her sister. That is just SO Ramona. OMG! The chicken costume! (ok, well, technically yes a rooster I guess!). I saw it there at the thrift store last week and almost bought it (the matching orange pants were with it when I saw it, but in danger of getting separated). Why do I know this? 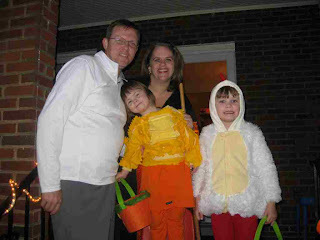 Because E had the costume in size 18 months, and A wore it, too, last year. BECAUSE IT IS THE CUTEST THING EVER. EVER. LOVE. Teehee. And where is the photo of that little black (and orange) number you picked up, hmmm? love that orange and yello wcostume, well done! yes, where is the picture of your new costume??? Wow. Way to sum up your children in one sentence. Love it! And you'll be wearing your outfit on Friday, right? I agree with Fiona - want a picture of the witch costume, please!